Alice is desperate to rescue her sister Mayura, who has been ensnared by the embodiment of evil called Darva. In defiance of Nyozeka's warnings, Alice and the other young Lotis Masters enter the Darva before having found the Lost Word. 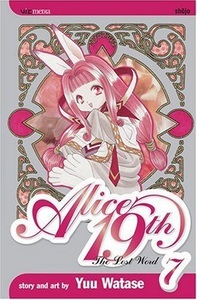 When Kyo, her true love, comes under attack, it's up to Alice to save both him and Mayura with the power of the Lotis. When it seems that all hope is lost, Nyozeka has an essential role to play... You won't want to miss the powerful conclusion of Alice 19th!